Chatham 1 bath shown in Nero Marquina and Thassos. I’ve known Craig Norberg for many years. 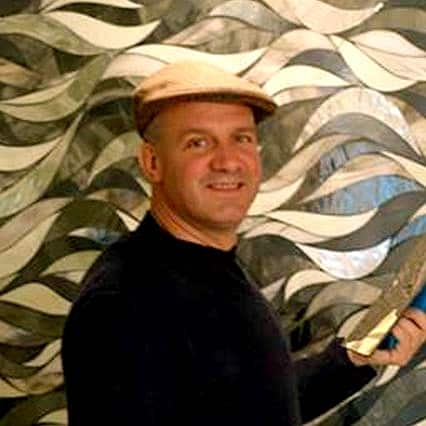 His Norberry Tile has been producing high-end, custom-designed tiling for houses since 1997. On May 21, Craig will again have a retail outlet. It’s been a few years since the closing of his location in the Seattle Design Center. Prior to that he had been on 2nd Avenue S. in Pioneer Square. But anyone who knows Craig’s creativity and attention to detail and service will be heartened to hear he’ll soon be opening a full retail operation at 1400 31st Ave S. in Leschi, where he’s maintained a small office since leaving the Design Center. I’m very familiar with this spot because it’s near my house, on a super sweet street with two restaurants, two coffee shops, two gyms and now his store. On my neighborhood walks, I’ve been able to check his progress through the front window and recently decided it would be fun to contact him for a Seattle Arts & Architecture profile and get the full story on how he got to this point and what lies ahead. That reality check was pivotal as Craig instead pursued a general liberal arts degree and upon graduation decided to follow his real passion: hands-on work designing tile for the design-build market. At 27 he became the youngest tile salesperson at a newly opened Waterworks in Manhattan, the company’s first showroom outside of Connecticut. It was then that Craig headed back to Seattle where his father, Doug Norberg, was a commercial developer with Wright Runstad and Co. He began providing sustainable materials to Wright Runstad’s LEED-driven projects, and soon Norberry Tile was born. “The concept was to bring craft and design back to construction with a sophisticated pallet of hard surfaces for architects and designers,” he said. Other public installations where Norberry Tile’s work can be seen are The Raw Bar at Salty’s, Seattle Art Museum and the original Restaurant Zoe. Craig, who has lectured at Historic Seattle events, continues to represent tile and period hard surfaces for Historic Seattle fundraisers and Seattle’s Preservation Guild among others. He is co-chair of the Mount Baker neighborhood’s Home Tour, which has been held every other year since the 1970s to raise funds for the oldest sustaining clubhouse in Seattle. Now Norberry Tile is back with a retail location that will also serve as a teaching studio for design. But there’s a twist. The new location on 31st Ave. S is called Norberry Tile and Plumbing Studio. “Elijah Farrell has been brought on as the plumbing guru,” Craig explained. “His extensive experience selling for Keller Supply, along with his reputation for customer service, has made him a favorite salesperson among many vendors. He’s going to help solidify Norberry’s position in both the tile and plumbing industries. To learn more about Norberry Tile and Plumbing Studio, visit their website. And to keep up with Craig’s latest news, subscribe to his blog.